I love taking photographs of my children during days out but have to say it's not always the easiest of tasks. The photographs you see on this blog post are often one of many I have struggled to take. 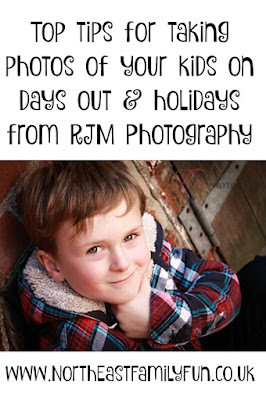 Luckily for me, I have a team of experts on hand to ask for advice and the lovely Rachel from RJM Photography has kindly agreed to share her top tips for taking photographs of your children during your spring/summer adventures. As a parent, I always look forward to this time of year. It’s the start of warmer weather and lighter evenings. That means days out, picnics, adventures and fun! My two boys are used to me always pointing a camera at them - sometimes I feel like the Paparazzi. Well I probably am, although I like to think my images are much more artful than their tabloid snaps. Through the years of being a child and family photographer, and also a parent, I have learned some great techniques on how to get the best photographs of children outdoors. Here are a few I’d like to share with you. Plan ahead. If you would like to take some images for prints or have an album in mind, I’d recommend packing your camera rather than relying on your Smart phone. As well as being better quality for printing, your digital camera will be less like to get full or lose battery power- which tends to happen to me and my Iphone 4s all the time (really must upgrade soon)! Tell a story. Through the years of watching my own children grow up, my favourite pictures are always those that tell a story. I do this by capturing moments throughout the day. Portraits aren’t just about your child smiling at the camera. Think about capturing other clues of your adventure, like a toy left abandoned on the grass, the picnic feast, the wellies covered in mud or even a shadow. I may not put these kind of photos up on my chimney breast but I have them in a cherished photo album and when used alongside the other main images of the children, it always brings back happy memories and emotions of fun times. Don’t be frightened to take lots of photos that seem a bit random at the time. They will all work together beautifully to complete the story. Dynamic action shots can be full of energy. These are the shots that will make you smile when you look back at them, and help portray the fun you had on your day out. Usually your child will be well up for these kind of shots and, if they’re like my two boys, probably start striking a pose or doing crazy stuff. Look for different angles, I like getting really low. It adds a fun perspective to the photograph rather than a straight on view point. Don’t force it. I’ve been there before and it gets frustrating for everyone involved. When the kids are engrossed in some fun activity and we’re interrupting them saying ‘’look over here….smile, no not like that, smile normally….no, look this way ….argh’’ Kids will be kids and they can be rather stubborn. You run the risk of getting images where their smiles are fake and their eyes look disengaged, so it’s really not worth the hassle. The main thing is that you have an enjoyable day out with your family! Expressions. Capture the kids when they don’t realise you’re there. These are the shots that will touch you emotionally. Laughter and genuine interaction are the golden nuggets of a great set of photos. You just can’t stage these things so this is where you use your inner paparazzi. I hope I have given you some great tips to try out next time you’re on a day out. Thanks Rachel - I love the idea of storytelling through photography and I'm definitely going to look for snapshots from our day during our next days out. Don't forget to follow RJM Photography on Facebook where Rachel often shares her top photography tips. Rachel offers family photography from only £50. 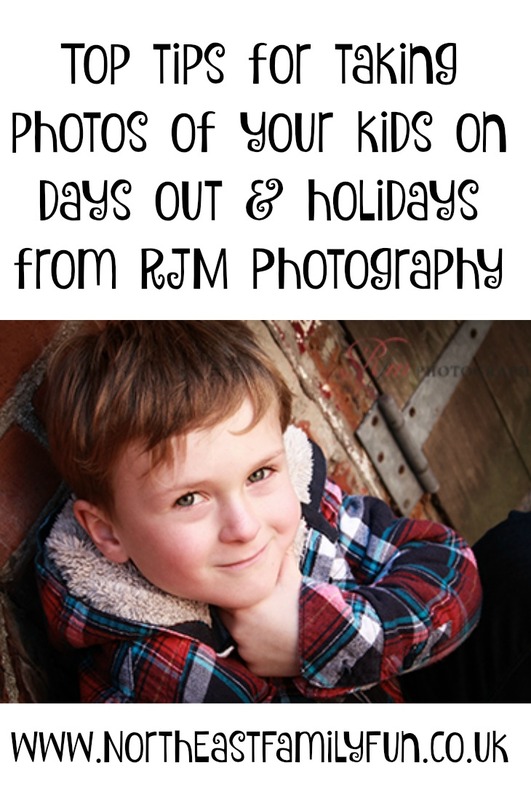 Visit RJM Photography or send Rachel a quick email for more information. Thank you to RJM Photography for providing the beautiful images used in this post. Great tips, im a photographer but i struggle at times, Lily hates having her pic taken and i have to catch her in a good mood. I know all about struggling to take pictures of the kids. They never stay still. Thanks for these tips they are great! My son flicks between posing and running so fast I can't hope to catch him!